Dry Creek has gone to the dogs! While not officially a dog park, this open space park is the perfect place to take a hike or run with your favorite pooch. There are 1.3 miles of trails that open up into a spectacular meadow. While Dry Creek isn’t officially a dog park, its neatly fenced-in confines and wide open spaces make it Boulder’s biggest unofficial dog rodeo. The 1.3 miles of trails are flat, dirt paths that meander next to Dry Creek for 0.4 miles before entering a glorious, open field where dogs can really zip around. At the west end of park is a majestic cottonwood tree that is over 200 year old and occasionally hosts bald eagles in its hundred-foot high branches. While it’s possible to get in a nice little hike or trail run at Dry Creek, let the facts state that this scenic east Boulder park has gone to the dogs! The first 0.4 miles of the trail is fenced in. Along the way, a large colony of prairie dogs will no doubt tantalize pups -- but they are safely behind a thick, wire fence. At the end of this section is a small wooden bridge that goes over Dry Creek. Once in a while the little river lives up to its name and dries up completely, but for most of the year, the creek is in. Dogs (and humans) love a great romp in the water before going into the wide open field. There’s plenty of room to run here, though be wary of the fence on the far south side of the field; it’s only loose barbed wires and there are sometimes cows in the field on the other side. By mixing up the trails in the field, it’s easy to get in 2 - 3 miles of hiking or jogging. Or do a few laps. The views are great, especially at sunset. As previously mentioned, this park is ideal for friendly dogs to spend time off-leash. 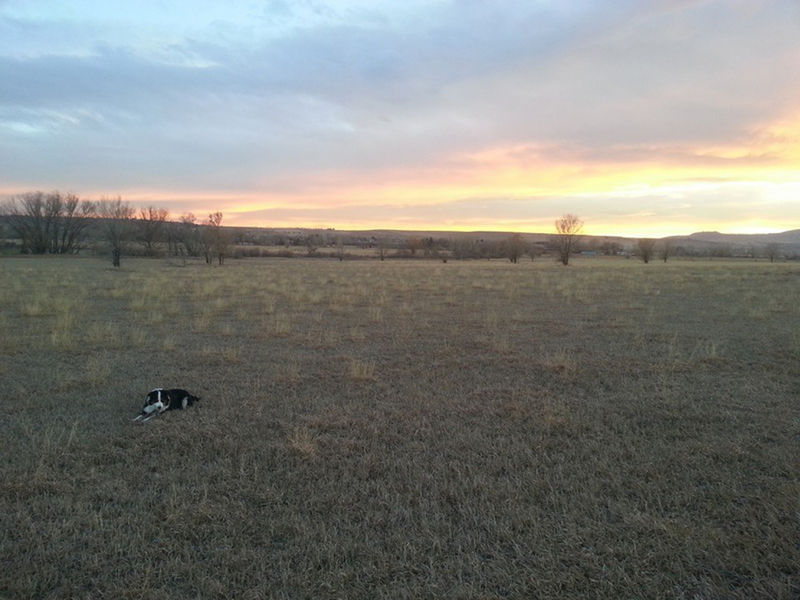 You will need a city of Boulder off-leash tag to let your dog roam free however. Weekends can get pretty busy, so if your dog gets overwhelmed by other pups or can’t help by try to herd little kids, it may be best to save your visit for a weekday. Your dog will love the smells and sights of Dry Creek! Most locals use Dry Creek for a quick visit or dog walk but it’s a pretty fantastic area to wander around for non-doggy people as well. There are many of Colorado’s favorite birds in the area and the towering cottonwood tree is an impressive testament to Boulder’s natural history. The prairie dog colony is also a neat addition to the area and it’s easy to get an up close look at the little guys from the start of the trail. From the intersection of Cherryvale and Baseline Road, go east 1.3 miles to the turn off for Dry Creek just past Baseline Reservoir. There is a large sign designating the trailhead.